Patients with suspected soft tissue sarcoma should be referred to the Bristol Sarcoma Service for investigation and management at Southmead Hospital. 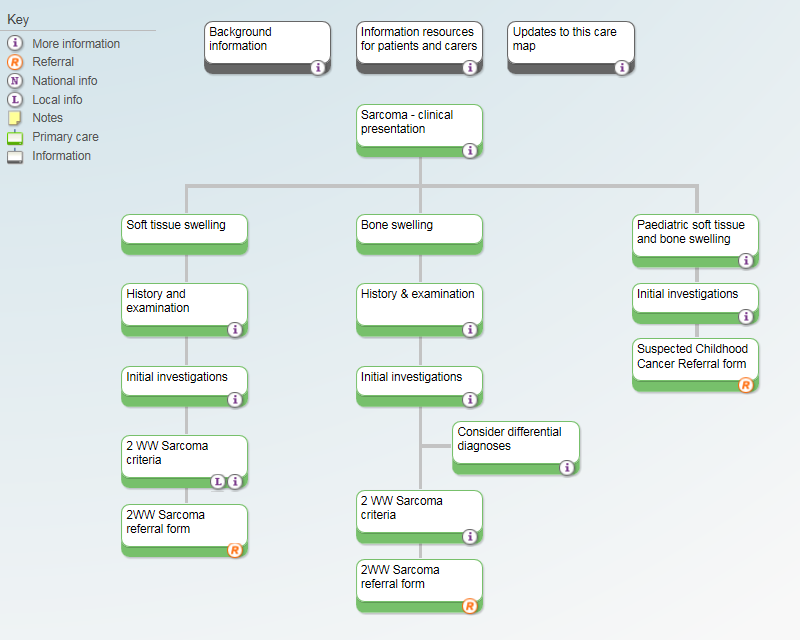 This can be done via e-Referral using the 2ww Sarcoma function. Patients with suspected bone sarcoma should be referred to the Oxford Bone Sarcoma Service. See relevant section below. Please use the Suspected Sarcoma 2WW Referral Form. The adult bone sarcoma service for BNSSG patients is provided by the Oxford Sarcoma Service based at Nuffield Orthopaedic Centre in Oxford and accepts referrals for adult patients aged 16 years and over who meet the Two Week Wait criteria. Referrals can now be made through e-Referral under the '2WW Bone' clinic type. Contact details for the Oxford Sarcoma Service can be found by accessing their website. For children with suspected sarcoma please see Suspected Cancer - Children and Young People Sarcoma. Please use the Suspected Bone Sarcoma 2WW Referral Form. for referrals into this service. As much detail as possible should be included with the referral and can be typed into the free text section of the form or added as a separate letter. Refer to the NICE cancer guidelines 2015 for Sarcoma. The ESMO / European Sarcoma Network Working Group. Bone sarcomas: ESMO clinical practice guidelines for diagnosis, treatment and follow-up. Ann Oncol 2012; 23 Suppl 7: vii100-vii109. National Institute for Health and Clinical Excellence (NICE). Guidance on cancer services: improving outcomes for people with sarcoma− the manual. London: NICE; 2006. National Comprehensive Cancer Network (NCCN). Guidelines in Oncology, v.1.2013. Bone cancer. Jenkintown, PA: NCCN; 2013. National Institute for Health and Clinical Excellence (NICE). Referral guidelines for suspected cancer. London: NICE; 2005. Royal College of Physicians (RCP) and The Royal College of Radiologists (RCR). Evidence-based indications for the use of PET-CT in the United Kingdom 2012. London: RCP/RCR; 2012. National Institute for Health and Clinical Excellence (NICE). Mifamurtide for the treatment of osteosarcoma. Technology appraisal 235. London: NICE; 2011. NB: Symptoms of malignant bone tumours cannot be reliably distinguished from a number of benign conditions . Soft tissue sarcoma are usually found by a patient when a lump appears on the leg, arm or trunk. Benign lumps measuring less than 10cm in diameter, such as an ultrasound confirmed lipoma, can usually be safely observed. Arrange an urgent direct access ultrasound scan locally (to be performed within 2 weeks) to assess for possible soft tissue sarcoma in adults with an unexplained lump that is increasing in size. In cases where suspicion is low (e.g. probable stable lipoma or cyst), refer for a routine ultrasound locally. If scan does NOT confirm benign disease refer as below. NB: Sometimes there is no palpable abnormality on presentation in primary care . NB: There can be failure to recognise a bone tumour on X-ray because of their rarity; access to expert opinion to interpret an abnormal X-ray is thought to reduce this failure rate . Suspected paediatric (age<16) soft-tissue and bone sarcomas should be referred directly to the Paediatric Oncology Service at Bristol Royal Hospital for Children using the Childhood Cancer referral form and should be scanned within 48 hours. Unexplained bone swelling or persistent or unexplained bone pain - refer for urgent plain film x-ray. Further action according to result. Unexplained soft tissue lump which is increasing in size - refer for urgent ultrasound scan. Further action according to result.